About Us | IME | PROMED SERVICES | Honesty. Integrity. Credibility. Promed Services has been providing Impartial Medical Evaluations (IME) for over 30 years. The company has benefited from connections with the most prestigious area hospitals and credible physicians during this entire period. During our history, we have established ourselves as one of the most quality oriented, conscientious and hardworking firms in the Midwest. Our Medical Director is Dr. Robert Welsh, Chief of Thoracic Surgery at William Beaumont Hospitals in both Royal Oak and Troy, Michigan. Mary Wren, our Administrative Director for over twenty-five years, has committed herself to ensuring that we provide a quality product to our clients, and prides herself on the customer service for which we are known. Our entire client support staff is dedicated to this same level of service. Dr. Welsh is the Chief of Thoracic Surgery for both Troy and Royal Oak Beaumont Hospitals. 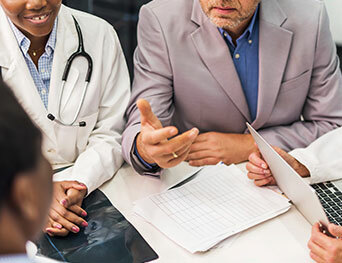 As Promed Services Medical Director, Dr. Welsh advises on specific case needs and actively reviews Physician requests and selections for addition to our provider Network. Mr. Jeffrey A. Welsh was named president of Professional Medical Services in 2004. While continuing the traditional focus on our quality image and the “above and beyond” service level established during his father’s (Dr. Gary J. Welsh M.D.) ownership of the company, Mr. Welsh is also dedicated to enhancing our services with today’s technology when those advancements make life easier for our clients. In her role as Administrative Director for Professional Medical services, Mary supervises the processing of all cases brought to us by our clients. She has been with us since 1989, and she personifies our commitment to client satisfaction. Stacie joined Professional Medical Services in 2005 as an Appointment Coordinator. She was previously a valuable contributor in an area physician’s group practice where she provided quality control for medical record accuracy. These experiences have made Stacie even more effective as she handles her current role as Senior Account Executive. Tom handles all the details needed to arrange appointments for your claimants with our physicians, and monitors the logistics of getting records and reports to the appropriate place in the requested format and in a timely manner. In addition, he maintains our archives and supervises the reception of any examinees that come to our offices for their medical evaluation.